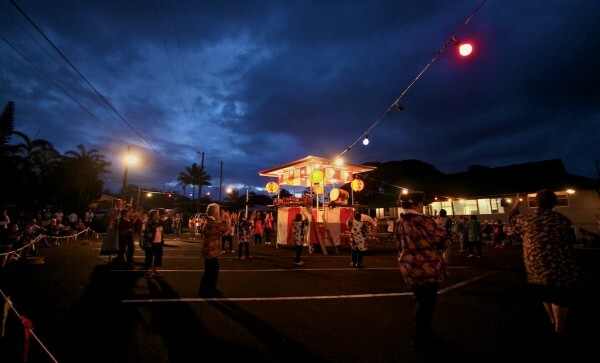 Did You Know it’s O-Bon Festival Season in Hawaii? It’s officially summer and that means Bon dance time in Hawaii! Across the Big Island and the state, the annual Japanese Buddhist tradition of o-bon festivals takes place from June through August. These fun cultural events tend to draw large crowds and are renown for serving incredible food at reasonable prices. What is an O-Bon Festival? O-bon festivals, or bon for short, are a Japanese tradition dating back more than 500 years that celebrate life and pay tribute to the dead. 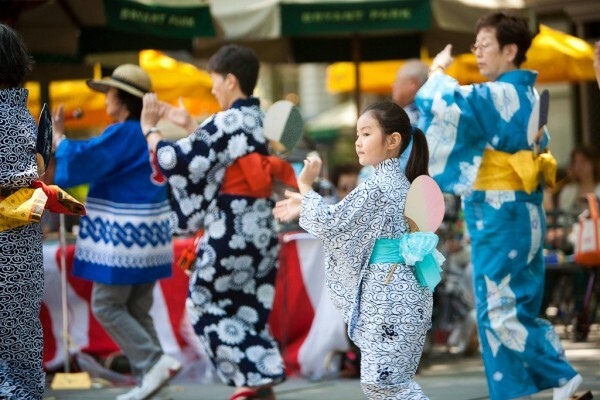 Typically held on a Friday or Saturday evening, the bon dance festivals feature taiko drumming, dancing, and food. Lots of food. Dancers wear happi coats and cotton yukata kimonos and dance (called the bon dori) in a circle around an elevated stage called a yagura that has been decorated with white and red ribbons. Musicians playing string and wind instruments perform atop the yagura from which lighted paper lanterns are strung across the temple grounds. Japanese workers who came to Hawaii to work on the sugar plantations, brought their cultural traditions with them and built small temples, called hongwanji in the communities in which they lived. With its rich soil and temperate climate, the Hamakua Coast was home to several sugar plantations and there is a hongwanji in nearly every small community from Hilo to Hawi. That means you’ll find more bon festivals along the Hamakua Coast that any other part of the island. There’s a bon festival nearly every single weekend now through August along the Hamakua Coast, including Laupahoehoe, Honomu, and Hakalau, just to name a few! During the sugar plantation era, bon dances were often the big event of the summer and today they still draw folks from far and wide, in part due to the legendary amount of delicious food, which is sold as a fundraiser for the host hongwanji. More than just a vestige of Hawaii’s plantation days, bon festivals are a way for friends and family to relax and reconnect. There’s a welcoming vibe to these family-friendly events, and admission is often free. What’s more, you don’t need to be Japanese or Buddhist to participate. Join in the dancing if you wish (it’s not difficult), or sit and talk story with friends. Bon festivals are a great way to learn about local cultural traditions, sample some amazing food, and have fun. If you haven’t been to one, I encourage you to check them out. I’ve lived along the Hamakua Coast for two decades and charming festivals like these are one of the many things that make living in Hawaii so special and unique. Here’s a list of Bon dance ceremonies along the Hamakua Coast this summer courtesy of the Big Island Buddhist Federation. Dates are subject to change; contact the local Hongwanji for the latest info, including times. If you’d like information on Hamakua properties for sale, give me a call today at (808) 937-7246 or email me BeverlyMolfino@ElitePacific.com.